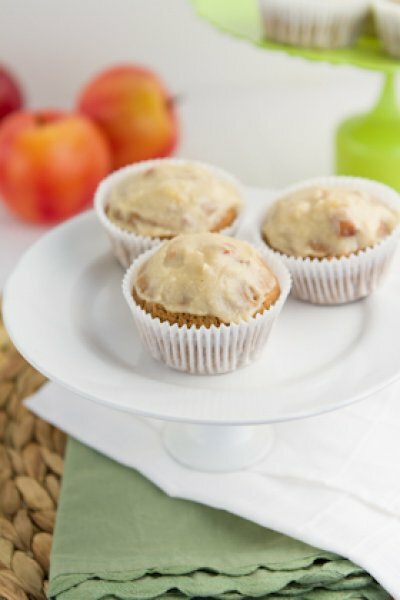 Fluffy, irresistible grain-free cupcakes filled with a gooey and sweet apple pie center and topped with dairy-free cream “cheese” icing. Preheat oven to 325F and line a 12 cup muffin pan with muffin liners. Set aside. Divide batter into prepared muffin cups. Bake in preheated oven for 30-35 minutes, or until toothpick inserted comes out clean. Allow cupcakes to cool in the pan for 1 minute before removing from the pan and placing on a cooling rack to cool. Add oil to a medium-sized frying pan. Heat on medium heat. Add remaining ingredients and saute for 8-10 minutes until apples are crisp tender. Add all ingredients to a small food processor or blender. 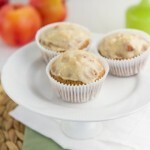 To insert the apple pie filling, use a melon baller to scoop out a circle of cake from the top of each cupcake. Drop a tablespoon or so of apple pie filling into the hole of each cupcake and press the mixture gently so that it’s flush with the top of the cake. Drop a dollop of frosting onto each cupcake and smooth with an icing knife.